Everyone has that one gorgeous piece of jewelry that they take out from its box and gaze at in wonder, almost on a daily basis. That one piece that’s treasured beyond belief, and held in such high regard that it’s the focus of various photos on Instagram and Facebook. However, it’s also that one piece of jewelry that you rarely wear. It’s left to shine and sparkle in its case, waiting for the one or two formal events you attend a year. Well, it’s time to stop. 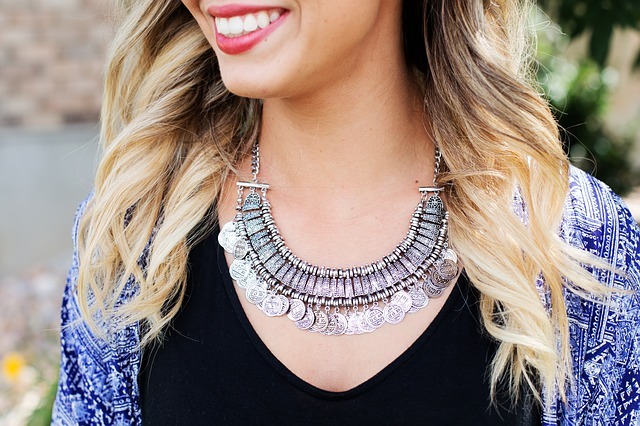 It’s time to get that gorgeous statement piece out, and rock it every single day. Jewelry is there to be worn and admired – and not just when you’re wearing a ball gown at a big do. Here’s your guide to wearing flashy pieces, every day. Before you start outfit planning, and deciding what you want to wear, think about what you’ll be doing during the day. If there’s any risk of you losing your jewelry, it’s best to wait for another day, and tone down your jewelry choices. Rings are normally quite easy to get away with on an everyday basis. From unforgettable yellow diamond engagement rings to sparkling, glittering sapphires; wearing loud, bright rings is fun and easy. The only time you might want to be careful and not wear a big statement ring is if you’re going to be doing physical activities or exercises. You wouldn’t want to catch your skin or hair with the ring’s rock, and nor would you want to damage it! When you want to pair your statement jewelry up with normal outfits, stick to muted colors and fabrics. You want the attention to fall on your jewelry, not your clothes. Plus, if you’re wearing exotic colors and prints, you’ll end up clashing. Choose a shade that stands out in your jewelry, and pair it with a darker version in your wardrobe. While you might be ok with louder skirts or trousers, you should keep it simple on your top half. Depending on what kind of jewelry you’re wearing, try to find a cut that emphasizes it. If you’re wearing a statement necklace, look for either a high-necked top, or one with a lower neckline. The high-neck will provide a good background for the piece – as long as it’s dark enough – whereas a low-cut top will give no distractions, and let the necklace hang beautifully. Likewise, if you’re pairing up a lovely bracelet, aim for short or cropped sleeves. That way, you can put your bracelet on display, and not worry about it getting caught up in loose threads or baggy sleeves. If you’ve got a statement piece to show off, let it be the centerpiece. For example, a gorgeous ring with a statement necklace works – but if you added a big pair of earrings in too, you’d look quite over the top. For an ordinary day at work or the shops, you don’t need to glitter and sparkle in the same way as when you’re at a do. Likewise, stick to bags and purses that are elegantly appealing: you don’t need another bold piece paired with your outfit.